Crumbling Paper: Bad Mans! Sweet Violet! Help! Here’s a hilarious example I scanned of Bad Mans! from 1911 by Jimmy Swinnerton. Click here to read examples of Swinnerton’s Little Jimmy at Barnacle Press. Click here to read examples of Swinnerton’s Mr. Jack at Barnacle Press. Click here to read examples of Swinnerton’s Mr. Batch at Barnacle Press. Read an article from 1906 about Jimmy Swinnerton at The Stripper’s Guide. See an example of Swinnerton’s Mount Ararat (second series) at The Stripper’s Guide. See examples of Swinnerton’s An Embarrassing Moment at The Stripper’s Guide. See examples of Swinnerton’s Canyon Kiddies, Mr. Jack, Mount Ararat and Little Jimmy, as well as some of his landscape paintings, on Coconino Classics. 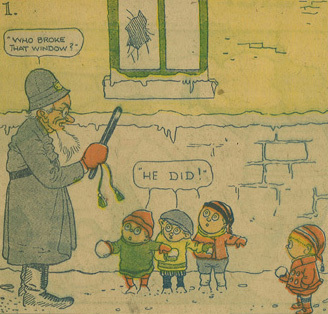 See examples of a variety of strips by Swinnerton at Ohio State University’s Newspaper Cartoon Artists online exhibit. Click here to read about Jimmy Swinnerton at lambiek.net. Click here to read more about Little Jimmy at Don Markstein’s Toonopedia. Click here to read more about Jimmy Swinnerton at Don Markstein’s Toonopedia.